I have so many ideas for holiday blog posts... If only I had the time/energy to do them all! Luckily, I'm not the only blogger in the world doing holiday themed posts this time of year. There are so many awesome posts that I've been reading lately, and I really can't get enough of them! 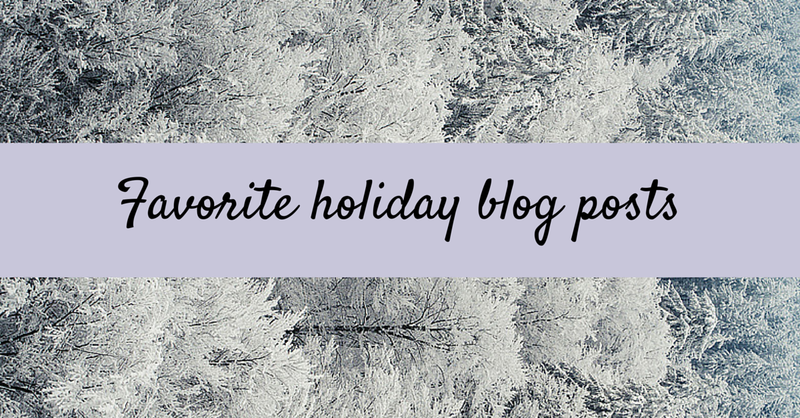 Here are a few of my absolute favorite holiday posts from other bloggers so far this season. The holidays can be stressful– presents to buy, people to see, places to go, ice to avoid slipping and falling on, etc.– but Marissa is here to help. Follow her advice and let yourself breathe and enjoy this holiday season. My gift motto is "get them something they never knew they wanted," which mostly means accessories. This is an awesome guide to buying accessories to gift for the holidays and includes some really unique items. Gifts for the home are always appropriate and appreciated, but they can often be easily forgotten. If you know someone who's impossible to shop for, check out this guide and get them something for their home! Now this is something I'm all about– saving money! Whitney's tips are super awesome if you're a 20-something looking to be able to spoil your family and friends without going into debt. Besides, it's always an appropriate time to save some money. There are plenty of holiday guides targeting a giftee in specific, but isn't it fun to take a different approach to a gift guide? These are all awesome gift ideas, and the fact that they're alphabetized adds just enough of a twist that it's fun to read. I'm obsessed with this post series and can't wait to see all the awesome braids Kim comes up with in the 25 days leading up to Christmas! It's unique and seriously cute and also applicable to anyone that's looking for something new to do with their hair.